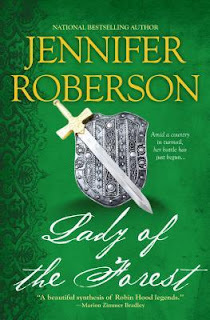 I've written about my love for Jennifer Roberson's Robin Hood retellings before. But imagine my delight when I saw they were being reissued this summer with these lovely new covers. These two companion novels have had a good variety of covers, from a sort of old school fairy tale historical to super romancey bare chestedness. All in the interest of attracting people from different reading backgrounds who might read and love these books. But I am kind of digging these new ones, as I think they have the potential to appeal to the widest spectrum of readers. I know I'll be snagging copies as soon as they're released on May 28th and June 25th respectively. They'll be just perfect for the re-read I feel coming on. Oh, I like these covers. I have the old fairy tale type covers and have always disliked the bare chest ones. . These new ones are nice and simple and look great together. Those are the ones I have as well. And I love them because they are my originals. But I do have high hopes for these new covers attracting new readers. The bare chest ones completely misrepresent them, IMO. Agreed. 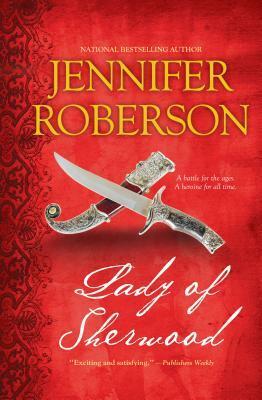 The romance is very nice, but there is so much more to the story. Have you? Lady of the Forest really is wonderful, isn't it? Glad I'm not the only one who buys up multiple copies without a second thought! Subtle, but pretty. I haven't read these, might have to look them up. How pretty! I love the cursive font used for the title. 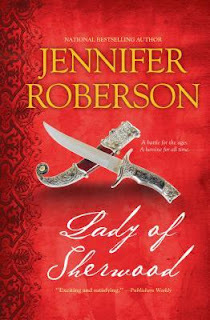 I've always wanted to read these, as I'm still on the lookout for that Robin Hood retelling that is just for me. Straight to the birthday wishlist they go! I'm curious what the original ones looked like. I must track them down on Goodreads, I think! Yes! Let me know which cover is your favorite. I linked to two examples in the paragraph above. Oh they got reprinted, that's good news! I have a used copy of Lady of the Forest but it's a huge hardcover that's hard to carry around, which is why I haven't read it yet. I hope they come out with ebook editions for these too. I'm always happy when older beloved books get reprinted. Ebook editions would be superb.